OBSERVATIONS ON THE GAME OF DRAUGHTS. The learner should select a few games for prac­tice, and become master of such variations as can be made from them ; and in respect to any games he may wish to reverse, let the following instruc­tions be attended to. Write down those figures required to make the numbers played from and to exactly 33, as in the example shewn in page 399. 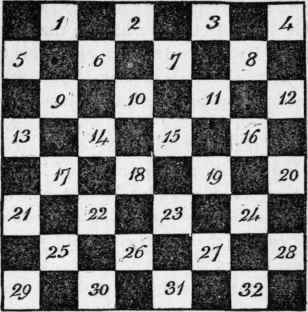 The game is begun by black moving from 11 to 15; and as 22 added to 11, and 18 to 15, each form 33, set down 22, 18 ; which, in reversing the game, must be white's first move. By acting in a similar manner with every succeeding move, the game will be completely reversed.